The Nature Conservancy of Canada (NCC) is working hard to conserve two sensitive ecological areas in the Eastern Shore Region — including one that without NCC’s involvement is destined to be cleared and made into over 20 cottage lots. Fishing Lake is located approximately 50 kilometres east of Halifax. The lake itself is long and narrow, measuring over four kilometres in length and 350 metres wide on average. It is surrounded by rocky shorelines. The 465-acre (188-hectare) property surrounding Fishing Lake is entirely surrounded by protected conservation land, making it a high priority acquisition for the Nature Conservancy of Canada that will help connect these areas and maintain biodiversity through interaction of species over time. The Fishing Lake property is dominated by Acadian forest and contains some of Nova Scotia’s last remaining wilderness. It contains red spruce, black spruce and balsam fir with stands of Tamarack on poorly drained sites. The landscape also harbours some endangered species, including moose, wood turtle and sensitive boreal felt lichen. The Program Manager for the Nature Conservancy of Canada in Nova Scotia, Craig Smith, says it is important to purchase the Fishing Lake quickly because of the high threat of development from its owners, who are based in the United States. Includes extensive conifer forest, riparian wetlands and 10 kilometres of shoreline. This 84-acre (34-hectare) site north of Martinique Beach is located within the Musquodoboit Harbour Estuary, approximately 30 kilometres east of Halifax. The land is privately owned and NCC is also trying to purchase this key island. The outer estuary is a designated Ramsar Wetland of International Significance. Young’s Island is a coastal island with intertidal wetlands, extensive salt marshes and mudflats. It contains a mix of coastal forest and barrens that support significant waterfowl, bird and marine life. The coastal forest here is reminiscent of the northern Boreal forest, containing mostly black spruce and balsam fir. Since 2000, NCC has been working with partners in this area, protecting a total of 1,350 acres (546 hectares). Young’s Island is the last major unprotected island; the last big piece of the puzzle. This site will most likely be developed if NCC does not protect it and the extraordinary ecology found here will be lost. The Eastern Shore region of Nova Scotia contains an outstanding assemblage of biodiversity features, including extensive and rich coastal ecosystems, conifer-dominated Acadian forests and a large network of freshwater lakes and streams. All provide habitat for a diverse flora and fauna. Some of Nova Scotia’s largest remaining intact forests are found here. The Musquodoboit River, which runs through the natural area, is the richest river valley in this region of the province. 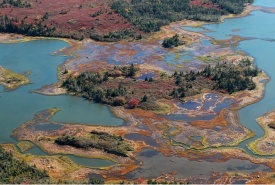 Its banks contain rich floodplains and adjacent wetlands, a comparatively healthy population of Atlantic salmon as well as several populations of federally threatened wood turtles and provincially sensitive sea-run brook trout. Sandy beaches throughout the area provide breeding sites for the endangered piping plover and rocky shorelines provide habitat for the Harlequin Duck, which winters in small numbers along the coast. For more information on these projects or to contribute to the conservation of this province’s natural heritage, contact the Nature Conservancy of Canada in Nova Scotia at 902-405-4334 and speak with Craig Smith or Donna Wellard.